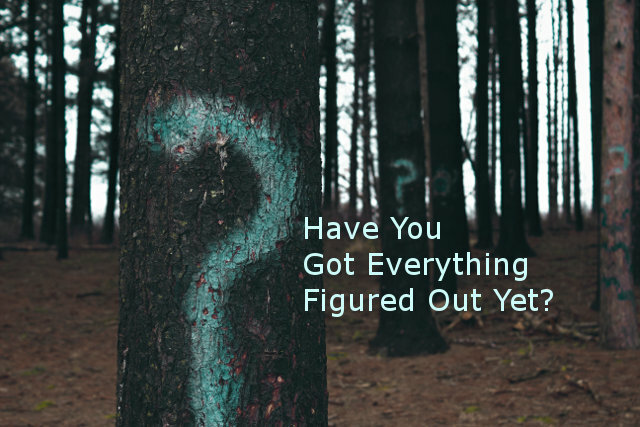 Have You Got Everything Figured Out Yet? 2 Opinions 3: 5 Blessed are those that have everything figured out or think they do. Don’t try to look this verse up, it’s a joke! Does life make sense to you? Are you still trying to figure how this planet works or have you given up by now? Let’s face it, life is confusing at times. Sometimes, just when I think I have everything all figured out, everything turns upside down. Can you relate? Should I blame God for this confusion? I don’t think so. I believe that mankind, generally speaking, has been guided by the devil, who has pervaded our society leading us to run counter to the ways of the Lord. Sound strange? Jeremiah 10: 21 The shepherds of my people have lost their senses. They no longer seek wisdom from the Lord. Therefore, they fail completely, and their flocks are scattered. You’d think she’d know better, the devil directly contradicts God’s Instruction, she seems to be seduced by the fruit (and by Satan) and she just had to eat it, didn’t she? Does this sound familiar to you? Can you relate to this? Proverbs 14: 12 There is a path before each person that seems right, but it ends in death. 1 Samuel 13: 7 …Meanwhile, Saul stayed at Gilgal, and his men were trembling with fear. 8 Saul waited there seven days for Samuel, as Samuel had instructed him earlier, but Samuel still didn’t come. Saul realized that his troops were rapidly slipping away. 9 So he demanded, “Bring me the burnt offering and the peace offerings!” And Saul sacrificed the burnt offering himself. He just couldn’t wait, could he? But how much longer? Apparently not much longer; and why did he disobey? Saul was surrounded by dreadful circumstances, but if only he could’ve waited a little longer. The message I get from this is that Saul’s heart was motivated more by fear than by God. There were miraculous events that led him to be king and he was given a golden opportunity to lead God’s chosen people and he blew it because he just couldn’t wait long enough. It’s tragic, isn’t it? But God uses this act of disobedience to set the stage for King David, one whose heart is for God. This is what I receive from this: When my heart is for God, I willfully choose to obey Him, but if my heart is hard, not wanting to submit to Him, I’d just as soon do what seems right to me and not obey Him. Try telling this to your unregenerated co-worker, he’d give you the strangest looks, wouldn’t he? But for the one who desires God the most, this makes the total sense. Proverbs 20: 24 The Lord directs our steps, so why try to understand everything along the way? Will you trust God to give you the sense you need to stay close to Him? 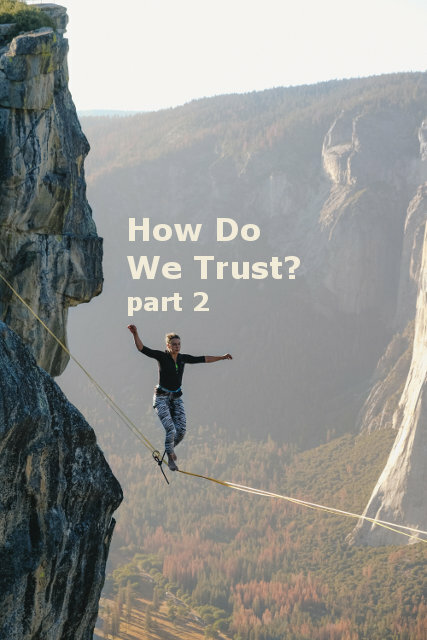 Does trust come automatically or is it learned? Of course, it is learned. Trust takes time. Just because someone says “trust me”, can we trust them? For those few people in our lives that we can trust, the people we say we can “count on” when things are tough, how was that trust developed? I am sure that those people have shown themselves to be trustworthy, over time. Perhaps they have come through for you like when your car broke down, or when you needed help with a personal emergency. But what about those times that require more than human help? What about a terminal illness or a dire financial situation? I’m sure you know where I’m going with this. Certainly, God is there for us when we need Him, but although we know this intellectually, do we know in our heart that we can trust Him? I think this verse says so succinctly what I’m trying to say. “Those who know your name trust in you”. Reading about trusting in God or listening to your pastor about trusting God is one thing, but actually trusting in God personally is a completely different matter. God tells Isaiah to visit the widow, so he goes. Isaiah asks for some bread, and as far as she’s concerned she has just enough for one more meal, then she and her son will die. 15 So she did as Elijah said, and she and Elijah and her son continued to eat for many days. 16There was always enough flour and olive oil left in the containers, just as the Lord had promised through Elijah. God has revealed Himself to her and she has a great testimony. I love this. In this process of the woman becoming a believer, Elijah is strengthened and encouraged by the whole event. I think that the daily miracle of just having food to eat prepared the woman for what was to come. God allowed the child to die just as He allows the storms to come into our lives so that we may see Him at work in our lives, learn to trust in Him, and also that those around us will know that He is God. Do those around you know that He is the Lord? 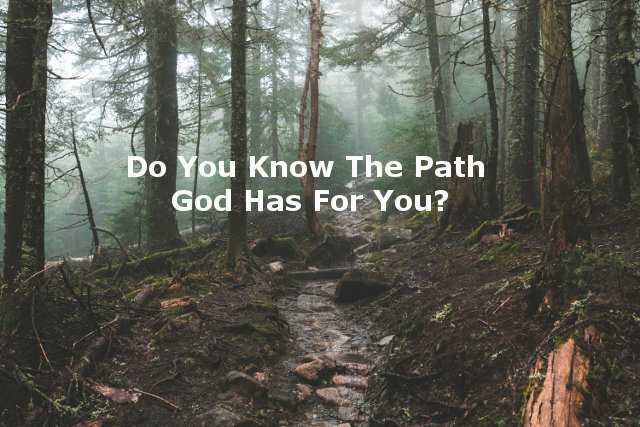 Do You Know The Path God Has For You? There is this question that I used to ask God frequently, “Where are you leading me?”. I still do at times. If you are truly seeking God’s will for your life and are willing to be used by Him, then you are right where God wants you today. Luke 8: 15 And the seeds that fell on the good soil represent honest, good-hearted people who hear God’s word, cling to it, and patiently produce a huge harvest. Your plan does not develop overnight and God rarely, if at all, informs His servants of the plan for them. I know that He has a plan for me, but I have no clue exactly what that is and where He is leading me. I am just another sheep that is trying to stay close to the Good Shepherd so that I can hear His voice. John 10: 27 My sheep listen to my voice; I know them, and they follow me. Hebrews 11: 8 It was by faith that Abraham obeyed when God called him to leave home and go to another land that God would give him as his inheritance. He went without knowing where he was going. 9 And even when he reached the land God promised him, he lived there by faith—for he was like a foreigner, living in tents. And so did Isaac and Jacob, who inherited the same promise. 10 Abraham was confidently looking forward to a city with eternal foundations, a city designed and built by God. Abram knew God had a plan, but he didn’t know exactly how it was going to work out. This is the same as Moses, who was 80 when God spoke with him from a burning bush. He was told to lead the people out of Egypt, but he didn’t know how it would work and how long it would take. I think there is a reason that God didn’t tell Moses that he’d be leading the Israelites through the desert for 40 years. But we know that Moses heard God speak, clung to God’s words and for the most part, remained patient. Of course, these are extreme examples of how God calls people, and there is much to be learned from all the servants of God throughout the Scriptures. If you haven’t lately, read the story of Joseph and how God used him (Gen 37-50). He had no control over his circumstances, but he continually had a heart for God and remained patient. God rewarded him immeasurably. I think a better question to ask God, one that I like to ask daily (although I don’t always), is “what can I do for you today, Lord?” I believe that God will use us immediately when we are willing and are sensitive to His voice. What people are in your life that you can serve today? Each of us has those people that God has put into our lives where we can exercise our love daily and/or weekly. If we can be found responsible for the ministry we already have, then He will give us more responsibility in His time. What talents, skills, or abilities do you have that may be used to serve others? Perhaps you have the gift of hospitality? Only you (and perhaps your closest friends) know the gifts that God has already given you. He may give you more, but for now, I am convinced that God has blessed you with something that He can use now. He’s given you so many years of invaluable life experience that He will use to bless others as only you can. You are special to Him and if you can continue staying close to Him and know Him more day by day then I assure you that He will use you in ways that you never would’ve dreamed. In the past, I was not a writer or even considered writing, and look what He has me doing week in and week out? 2 John 1: 9 Anyone who wanders away from this teaching has no relationship with God. But anyone who remains in the teaching of Christ has a relationship with both the Father and the Son. I consider the entire Bible to be the teaching of Christ, not just the red letters, for we know that “In the beginning was the Word”. It is the Word of God, in addition to prayer and fellowship that will develop your faith. Focus on getting to know God more and learn to put your trust in Him and Him alone and that is all He wants from you. It is from there that you will find the opportunities to serve. Are you plugged into a group of people that have the same passion for God that you do? Consider this an invitation to join us on the Bible Team call on Mondays (details below), we’d love to have you join us. Will you remain in good soil? What does it mean to be a Christian? Is it just a social club or something to say to fit in? Maybe you call yourself a Christian because your parents did and you don’t know any better. What does it mean to you to be called Christian? Is this truly your identity? Jesus said “come, follow me”. He did not say, “only if your heart is in it”, should you follow me. His command was direct and simple. So the disciples followed Him. It seems to me that the disciples stayed with Him, day after day. These ordinary men left their lives and their lively hoods behind them to follow their new Master. One day Simon Peter is a fisherman, the next day a trainee in the “fisher of men” program. One day Levi is a tax collector, the next he is following Jesus. These are radical decisions being made. The course of their lives changed overnight. They had no idea what they were getting into, but they followed anyway. God gave them new employment. Instead of working at the sea to catch fish for a living, Simon Peter was now working for God. Has this happened to you? Can you relate to this change of employment? Has God changed how He operates? Do you think He’s only called us to meet once a week and whatever spare devotional time there’s left in between? I think He still wants us to spend time with Him daily, listening and interacting with Him. There should be no difference in the Christian’s life from day to day throughout the week. Each day should be “Spirit-filled”. Romans 8: 5 Those who are dominated by the sinful nature think about sinful things, but those who are controlled by the Holy Spirit think about things that please the Spirit. 6 So letting your sinful nature control your mind leads to death. But letting the Spirit control your mind leads to life and peace. 7 For the sinful nature is always hostile to God. It never did obey God’s laws, and it never will. 8 That’s why those who are still under the control of their sinful nature can never please God. Being “Spirit-filled” or “controlled by the Holy Spirit” can happen only when we seek Him daily and spend time with Him. This is what is modeled for us in the gospels and it still applies today. 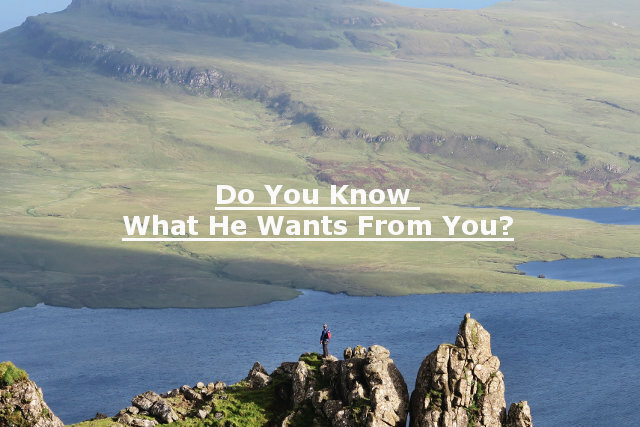 Has He called you to follow Him? Or when you read the above verses is it “someone else” He’s called, like your cousin who’s now a missionary? Pastors and missionaries are not the only people that have been called. As a matter of fact, not all pastors have been called! If you’ve repented (changed your mind) of your sins and turned to God, then you’ve been called. The ambassador position mentioned in 2 Cor. 5 is not a part-time position. I think if anyone pursues or follows God seriously, as the disciples had, God would lead them into full-time work. They might not be asked to leave their jobs, but they’ll know that they’re now working under New Management. Matthew 9: 37 He said to his disciples, “The harvest is great, but the workers are few. Will you join His workforce? 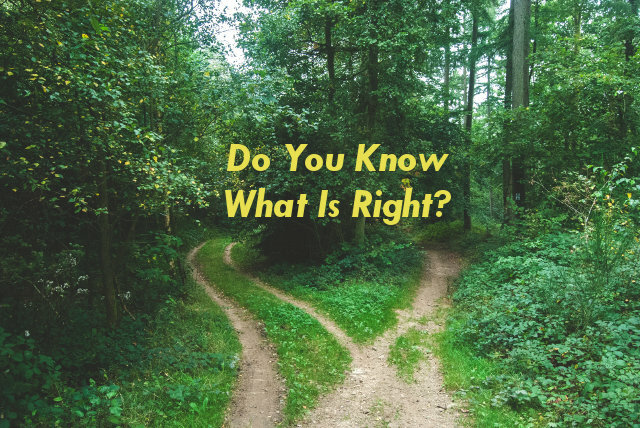 What is right and how can we know? Doing what is right can only be decided by God. He is the one who created us and thus sets the standard. The internal struggle in all of us is deciding for ourselves what is right and wanting to contradict God thinking that we know better. Judging someone just because of something I think is wrong is never the right thing to do. For one thing, it may be right in God’s eyes and even if it is wrong, it’s not my role to judge. Romans 14: 1 Accept other believers who are weak in faith, and don’t argue with them about what they think is right or wrong. 2 For instance, one person believes it’s all right to eat anything. But another believer with a sensitive conscience will eat only vegetables. 3 Those who feel free to eat anything must not look down on those who don’t. And those who don’t eat certain foods must not condemn those who do, for God has accepted them. 4 Who are you to condemn someone else’s servants? They are responsible to the Lord, so let him judge whether they are right or wrong. And with the Lord’s help, they will do what is right and will receive his approval. Was it right for God to harden Pharaoh’s heart? Exodus 9: 12 But the Lord hardened Pharaoh’s heart, and just as the Lord had predicted to Moses, Pharaoh refused to listen. Was it right for the Israelites to completely destroy their enemies? It may seem right to pay all of your bills first, before tithing, but is that what God desires? It may seem right to get my tasks done first, and then make time for God. I used to think this way, but now I know that that is not right for me. Although I can deduct this lesson from the Bible, Jesus taught me this first hand. This is why knowing our Creator personally is crucial so that we can learn first hand what is right on a daily basis and be convicted of it. Who determines right from wrong? Although Eve knew in her mind that eating the fruit was wrong, she had little or no conviction over it. She had not learned that lesson in her heart. Just like with Eve, the devil always has a way of questioning that which we already know is right and we can either “not depend on your own understanding” or go with what satan makes us think is right but is always an illusion. The ultimate question for everyone on the planet then becomes “Can I trust God to know what is right for me?” Can I disregard my upbringing, teaching, and worldly experiences and cling to the path that God has for me? Simply reading the Word of God is not enough. We need to meditate on the Holy Bread of God, plead with God to transform us into His own image (His original intent) and wait patiently, trusting that He will be faithful to complete that which He’s started in us. Only then can we learn in our hearts what is right. Only God knows exactly what we need so who am I to think I can find it in “Self” magazine? After all, if He defines and determines what is right, then doesn’t He know what is right for me? Jeremiah 18: 1 The Lord gave another message to Jeremiah. He said, 2 “Go down to the potter’s shop, and I will speak to you there.” 3 So I did as he told me and found the potter working at his wheel. 4 But the jar he was making did not turn out as he had hoped, so he crushed it into a lump of clay again and started over. To me, this is all about letting God be God and me be His humble servant. As soon as I start getting these roles reversed, I no longer ask Him what is right and determine that for myself. It is a matter of submission. Psalm 1: 1b He feared God and stayed away from evil. 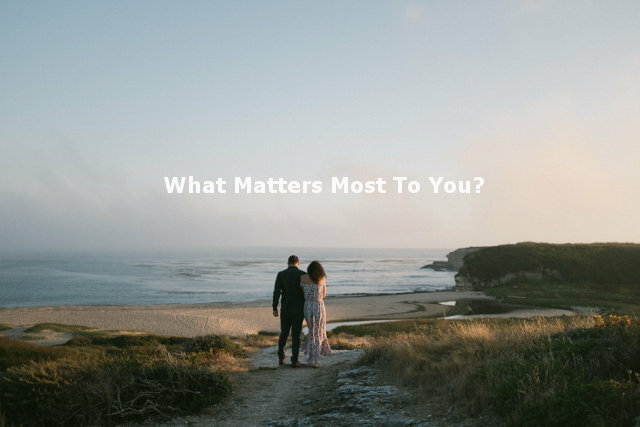 Working at a church may seem right and please the pastor, but if it is at the expense of your wife or husband and causes you to neglect those in your immediate ministry, then I would say it might be wrong. Only God knows what is right for you to do, and only you can know what that is by remaining in Him. There is no other way than to trust and obey! John 15: 9 “I have loved you even as the Father has loved me. Remain in my love. 10 When you obey my commandments, you remain in my love, just as I obey my Father’s commandments and remain in his love. 11 I have told you these things so that you will be filled with my joy. Yes, your joy will overflow! When we say in our own minds “I don’t know what to do” we have a choice between asking others and asking God. He promises to direct our steps. Admitting that “we don’t know” is a place of humility, which allows us to be used by God, because He gladly helps us and that brings glory to Him. James 1: 5 If you need wisdom, ask our generous God, and he will give it to you. He will not rebuke you for asking. 6 But when you ask him, be sure that your faith is in God alone. Do not waver, for a person with divided loyalty is as unsettled as a wave of the sea that is blown and tossed by the wind. 7 Such people should not expect to receive anything from the Lord. 8 Their loyalty is divided between God and the world, and they are unstable in everything they do. Will you do what it takes to know what is right?